The Skinny: This breezy new wave motion picture from the beloved/reviled Wong Kar-Wai ranks as one of Hong Kong Cinema's most winning and lovely experiences. This is quite possibly the Webmaster's favorite film. Ever. Wong Kar-Wai's films have always been steeped in Hong Kong-specific genre. As Tears Go By was a triad drama, and Days of Being Wild was a spin on the "teddy boy" disaffected youth genre. Chungking Express is no different. The protagonists of the film are two cops. Cop 223 (Takeshi Kaneshiro), also known as He Qiu-Wu, is a plainclothes detective who chases bad guys around seedy Chungking Mansions in Tsimshatsui. 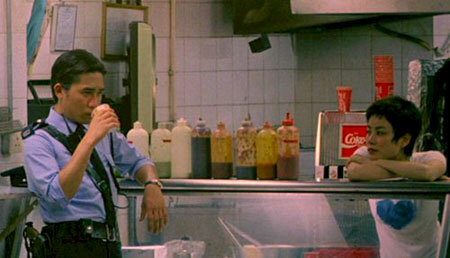 Cop 663 (Tony Leung Chiu-Wai) is a uniformed constable who patrols around Central and the trendy Lan Kwai-Fong district. The film also has a criminal: Brigitte Lin Ching-Hsia as a blonde-wigged, drug-smuggling femme fatale who finds herself targeted for a rub-out. But that's as far as the genre stuff goes. Despite these common signifiers, practically nothing you'd expect out of a cop action film occurs. There are a couple of chases, as well as a payback moment midway through the film, but the scenes play more like transitions instead of necessary plot development. What's more important are the character's inner lives. In Chungking Express, the standard genre character is fleshed out and humanized, and their inner struggles take on tremendous meaning. Wong Kar-Wai has created a Hong Kong cop thriller that's about the cops and not the thrills. Cop 223 may snag a perp or two, but what's more upsetting to him is his ex-girlfriend May, who he's still pining over. Obsessed with expiration dates (on love, promises and even canned food), he feeds his heartbreak by ingesting expired cans of pineapple - which isn't a good thing. Promising himself that he'll love the first woman he sees, he runs into the tired Brigitte Lin, who's suffering her own sort of heartbreak. The match isn't made in heaven, and any sort of physical affirmation of emotion would be unrealistic, but their encounter manages something quiet and affecting. In a sense, their meeting and shared individual pain creates a minor, almost infinitesimal bond between them. The moment passes, but something quietly indelible remains. Cop 663 has his romantic problems, too. Unceremoniously dumped by a lovely air hostess (Valerie Chow), 663 unburdens himself to his collection of inanimate objects: a stuffed bear, a bar of soap and even a wet rag. Unbeknownst to him, the cute, Jean Seberg-coiffed Faye Wong has silently fallen in love with him across the counter of the Midnight Express deli. Unable to overtly convey her affection, she contents herself with surrepitiously caring for him. She cleans his apartment, redecorates it, and quietly messes with his life. Whether or not he notices seems not to matter - it's just her personal expression of affection. The individual is at the center of Wong Kar-Wai's movie. Everyone has their own private way of coping with loss and alienation, and how each character does it feels both uniquely odd and strangely familiar. Wong Kar-Wai isn't concerned with happy endings, romantic platitudes or universal truths. No UFO-style pearl of wisdom surfaces in his film. One can identify with the characters or they can find their individual quirks absurd. That's probably one of the unique joys to Chungking Express - that the characters' quirks can affect each and every viewer differently. Wong Kar-Wai doesn't tell you anything with the film. The moments in the film are opaque and seemingly unconnected, but beneath that the viewer just might find something revealingly personal and achingly real. As you would expect from Wong Kar-Wai, the film is literally dripping with style, but it isn't over-the-top like his later Fallen Angels (the unofficial third chapter to Chungking Express) nor is it bombastic like Ashes of Time. Chungking Express operates with a quicksilver, almost effervescent vibe, where chances are found and connections made with one barely noticing. The camera (handled by co-cinematographers Christopher Doyle and Andrew Lau) moves constantly and sometimes gives in to jarring step-printing or strange slow/fast motion, but the moments are appropriate. It's those sequences that convey the interior/exterior experience of each character, be they the helter-skelter chaos of a chase or the noiseless isolation of sudden heartbreak. The style is alternately contemplative and breezy; it's like the French New Wave with a dash of MTV sprinkled in. Notes:  Chungking Express was released theatrically in the United States by Miramax and Quentin Tarantino's Rolling Thunder Pictures. In a move that WOULD NOT be trendsetting, the film was given a respectful release, and not cut or dubbed. In fact, additional scenes were added for the US release.